I know it’s just a machine, but I’m not, and what I’m feeling is real: a bit of sadness at the idea that after 15 productive and incredible years of driving around Mars and poking at rocks and digging in the red dirt, the tough little robot Opportunity may have finally died. Really, Opportunity may have passed into the etherial internet months ago, since it hasn’t been heard from since last June, when a major dust storm forced it into hibernation mode as its solar panels became covered in dust and sunlight itself was blocked by the clouds of dust from the storm. That dust storm kept growing and growing, and after 10 days it had grown into a Mars-wide planetary storm. The problem with Opportunity being forced into an extended hibernation mode wasn’t just that it couldn’t get enough power to operate; it also needed power to survive Mars, period. Because Mars is so cold, Opportunity used heaters to keep its electronics at safe temperatures. When things get too cold, they become brittle and can break, like tiny solder joints and connections all over the rover. Opportunity’s team at JPL has been hoping that post-storm winds may have cleared enough dust off the rover’s solar panels to let it get enough sunlight to charge up its batteries once again, get its little heaters going, and start up once more, like it has in the past. These solar panel dust-related issues will not affect the Curiosity rover on Mars, as that uses a nuclear radio thermal generator (RTG) for power. Yesterday, the final batch of signals were sent to Opportunity to see if the rover was alive and responsive, in any way. The final word won’t be revealed until JPL’s press conference at 2 p.m. Eastern time today, but most observers aren’t holding their breath. We’ll update as we hear more. You know what, though? Even if this is Opportunity’s end, there’s no reason to be sad. That little machine was only supposed to last for 90 days, and it went 15 freaking years. JPL knows how to build some rovers. 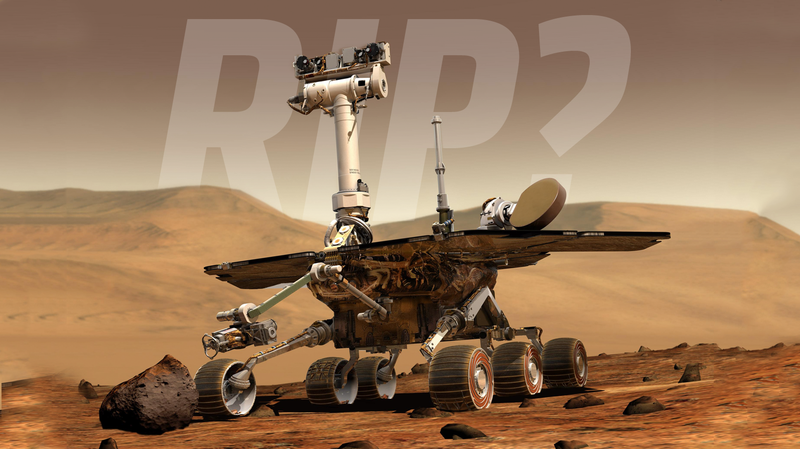 Opportunity drove over 28 miles on Mars, making it the furthest-venturing and longest-lasting planetary rover ever in human space exploration, taking the title from the old Soviet Lunokhod rover, which drove about 26 miles on the lunar surface. During its 15 years on the red planet, Oppy did an incredible amount of science, confirming Mars once had surface water, finding meteorites and traces of volcanoes and clays that could harbor life and so much more. If this is it for you, Opportunity, rest in peace. At least long enough for us to get there in person, give you a quick hose-down, and send you back out on your way, to explore.